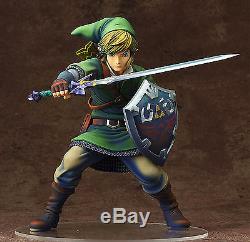 Legend of Zelda: Skyword Sword LINK 1/7TH SCALE STATUE Good Smile Max Factory. From the popular action adventure game The Legend of Zelda: Skyward Sword comes a 1:7 scale figure of the main character, Link! The unique appearance and style from the game has been brought to life with intricate sculpt work, and careful paintwork has recreated the shadows and textures in perfect detail to create a figure brimming with quality for fans to enjoy! 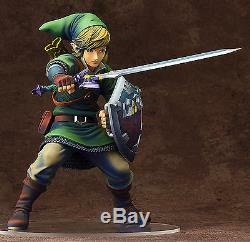 The Legend of Zelda: Skyward Sword Link 1:7 Scale Action Figure stands about 7 3/4-inches tall. Add the hero with the fate of the world on his shoulders to your collection, and enjoy his zealous spirit by your side whenever you like! T his statue is new and in its original unopened box. Box is in great condition and it will be packaged with care. Thanks for shopping at ComicChix! The item "Legend of Zelda Skyword Sword LINK 1/7TH SCALE STATUE Good Smile Max Factory" is in sale since Sunday, February 19, 2017. This item is in the category "Toys & Hobbies\Action Figures\TV, Movie & Video Games". The seller is "comicchixs" and is located in Vicksburg, Michigan. This item can be shipped to United States, Canada, United Kingdom, Denmark, Romania, Slovakia, Bulgaria, Czech republic, Finland, Hungary, Latvia, Lithuania, Malta, Estonia, Australia, Greece, Portugal, Cyprus, Slovenia, Japan, Sweden, South Korea, Indonesia, Taiwan, South africa, Thailand, Belgium, France, Hong Kong, Ireland, Netherlands, Poland, Spain, Italy, Germany, Austria, Bahamas, Israel, Mexico, New Zealand, Philippines, Singapore, Switzerland, Norway, Saudi arabia, Ukraine, United arab emirates, Qatar, Kuwait, Bahrain, Croatia, Malaysia, Brazil, Chile, Colombia, Costa rica, Panama, Trinidad and tobago, Guatemala, Honduras, Jamaica, Antigua and barbuda, Aruba, Belize, Dominica, Grenada, Saint kitts and nevis, Saint lucia, Montserrat, Turks and caicos islands, Barbados, Bangladesh, Bermuda, Brunei darussalam, Bolivia, Ecuador, Egypt, French guiana, Guernsey, Gibraltar, Guadeloupe, Iceland, Jersey, Jordan, Cambodia, Cayman islands, Liechtenstein, Sri lanka, Luxembourg, Monaco, Macao, Martinique, Maldives, Nicaragua, Oman, Peru, Pakistan, Paraguay, Reunion, Viet nam.